improvement. Current first-line ART is a big pill to swallow, it has some unpleasant side effects, resulting in poor adherence and virological failure, and resistance develops quite easily; it will not get any cheaper over time. From the more logistical aspect, the high dose of the drugs that make up first-line ART means they use more ingredients meaning they cost more, and is the reason the pill is so big, which in turn means the packaging is big, and takes up more space in the pharmacy. Clearly, we need treatments which are easier to take in terms of size and are cheaper. And if you compare first-line ART in lower middle income countries (LMIC), some of the drugs being used are no longer recommended in better resourced settings. 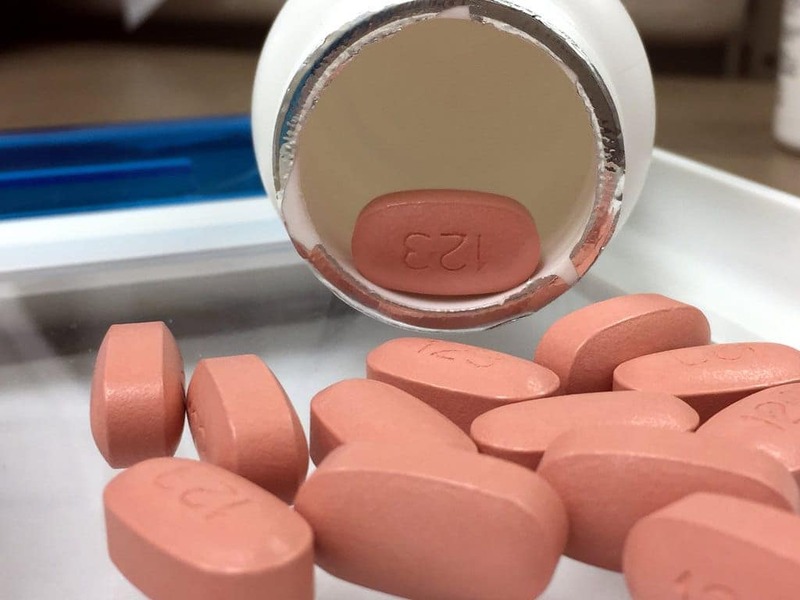 national guidelines, most people living with HIV (PLWH) will receive a combination of efavirenz (EFV), tenofovir (TDF) and emtricitabine (FTC) or lamivudine (3TC) as first-line ART. FTC/3TC, which are structurally almost identical, really contribute very little in the way of toxicity generally and are usually continued through subsequent lines of therapy so I am not going to say much more about them here, and going to confine my deliberations to EFV and TDF. What is great about this combination is that millions of PLWH around the world have been treated with it for years so there is a wealth of experience with it – a bit like that comfortable T-shirt we like to sleep in, for us as prescribers, but perhaps not so much for PLWH. The regimen has proven virological efficacy, is generally well tolerated, is simple to take as it is dosed once daily and is co-formulated into a single tablet fixed-dose combination (FDC). What are the problems with EFV? It comes with some unpleasant side effects (abnormal dreams, nightmares, hallucinations even and other neuropsychiatric type symptoms mainly; occasionally rash); has a very low resistance barrier; and requires a high dose. Its safety in pregnancy has been established despite a bumpy start in early development and it plays relatively well with most other drugs, including TB drugs (but not all, for example some contraceptives such as implantables). EFV is an example of one of the first-line drugs which has disappeared from first-line treatment in many wealthier countries. So how do we improve on EFV? There are a number of alternatives to EFV to consider which are currently available in South Africa. Rilpivirine (RPV) is one option, from the same class of ARVs as EFV, and is dosed at 25 mg (compared to 600 mg of EFV which contributes significantly to the size of the FDC). RPV is much better tolerated than EFV and is incredibly cheap, which is always good news in a drug which could be potentially be used to treat millions of people. The downside is that it is not yet available in any FDCs in South Africa, can’t be used with rifampicin-based TB treatment or in anyone with a high viral load when starting treatment, and in the public sector we don’t do viral loads at treatment initiation, so it too has its warts. However, it is being studied in some interesting new combinations so let’s not completely set it aside just yet. Certainly as a switch option RPV is a very good choice in patients who don’t tolerate EFV, and there are studies which support this. Dolutegravir (DTG) is another option already available in South Africa. Again, another low dose drug at 50 mg. In registrational first-line studies no one with virological failure developed any DTG resistance which means this drug is incredibly robust. DTG was also the first drug to ever beat EFV in a head-to-head study, where pretty much all others had previously tried and failed, and this was probably a lot to do with the fact that DTG is more tolerable than EFV. And as the saying goes, if it sounds too good to be true… In fact, there are emerging data suggesting there may be some side effects which include dizziness and anxiety. But this is coming mainly from European cohorts, which do not have the same genetic diversity of African populations. Currently a massive study called ADVANCE that compares DTG to EFV is underway in South Africa and includes screening for these types of symptoms. DTG is also available already co-formulated in SA with abacavir (ABC) and 3TC, but it is not practical to roll out this particular FDC programmatically as ABC is very expensive. But as DTG requires only a 50 mg dose, if it were to be introduced into the public sector programme, produced by a generic manufacturer with South Africa’s buying power as the largest consumer of generic ART in the world, DTG would be an affordable option for first-line ART, and is currently an alternative option in the WHO guidelines. With regard to DTG and TB drugs there is an interaction, which can be overcome by adjusting the dosing of the DTG, but this might not be necessary – some studies are underway to look into this. One of the current challenges with DTG is at this stage we don’t know a lot about DTG in pregnant women. Botswana made the bold move of introducing DTG into their HIV treatment programme in June 2016, including for pregnant women and it is anticipated that they will present data on the first pregnancies at the IAS conference in Paris in July 2017 which will start to fill this gap. So, we have a very robust drug that is well tolerated and can be co-formulated into a small inexpensive pill – looks promising. Then there are also other future third-drug options which are not available in South Africa (or indeed anywhere else) as yet. These include doravirine and bictegravir. Doravirine is from the same class of drugs as EFV and RPV. It is still in phase 3 of development (registrational studies) and whether or not it will ever hit our shores is unknown. Bictegravir, also in phase 3, is a drug which is very similar to DTG and is co-formulated with tenofovir alafenamide fumarate (TAF), which I will discuss a little more below, and FTC. So, moving on to TDF. The problems with TDF are in some ways similar to those with EFV. The high dose means a high active pharmaceutical ingredient requirement which drives the pill size and the cost. And it also has some toxicity associated with it. Currently, we do not have any alternatives available in South Africa that are any better but there is one which should be available soon, namely TAF (tenofovir alafenamide fumarate). TAF, like the TDF in current first-line ART is a pro-drug of tenofovir. TAF is given at a much lower dose (approximately 10-fold lower) than TDF. TAF is associated with much less kidney and bone toxicity than TDF. The ADVANCE study will also compare TAF and TDF, as most studies of DTG used ABC as the backbone, and also would not have included many African participants. 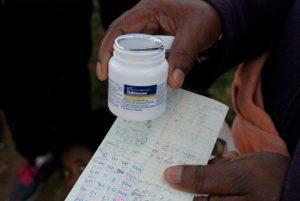 TAF has not been studied with TB drugs or in pregnant women as yet, but these studies are underway. Once we have a better understanding of this, on account of the better safety profile and the lower dose which will result in significant reductions in cost, TAF is set to be a favourable option to replace TDF. And in fact, if DTG, FTC and TAF are co-formulated potentially we are looking at a future first-line regimen, to quote Prof Francois Venter, “smaller than an aspirin” which is incredibly potent, incredibly robust, incredibly well tolerated, all while being incredibly cheap – incredible isn’t it? All of this is very important, while we have such tough targets to chase – the famous 90-90-90. And to achieve that third 90 we need to modernise treatments so that PLWH can adhere to them. When there are so many other challenges to overcome within a healthcare system, optimising ART to be as simple, safe, efficacious and robust as possible facilitates safer task shifting to other cadres of staff which may help alleviate some of the human resource shortages faced within healthcare facilities. But no matter how good the drugs are, ART does not exist in a vacuum, and ART alone will not achieve the three 90s. ART will not fix the healthcare system. ART will not address stigma. ART will not help us achieve that first 90 – 90% of PLWH knowing their status. ART will not find the missing in action to test them – the men, the key populations, the adolescents, girls and young women – and then link them to care to achieve the second 90. ART will not then retain them in care, and measure their viral load so we can see if we are reaching that third 90. Massive investment in infrastructure and development of systems backed by political will is critical. Civil society must remain engaged and all of this must be backed by a National Strategic Plan (NSP) that is realistic, detailed, and embodies the principles of equity and access. There is a massive amount of work to be done to conquer HIV in South Africa, but optimised ART is certainly a great step in the right direction. On Tribuss and losing weight. What could be the explanation? How long will this new therapy will take to be implemented? Wah what an educative article; brilliant thank you so much for the information. Obviously there’s is so much to be learnt.